New Innovative Way to Take Up Tolerances! Smalley Linear Springs are a continuous wave-formed (marcelled) wire length produced from spring tempered materials. They act as a load-bearing device having approximately the same load/deflection characteristics as a wave spring. Linear Springs are now available as a standard part in carbon and stainless steel, with over 200 sizes. Can integrated circuits handle 500 deg C on Venus? 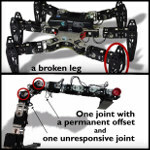 Can injured robots adapt like animals? 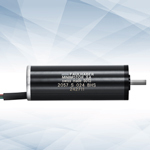 The new FAULHABER 2057 BHS Brushless DC Servo Motors are designed to address specific requirements of medical and dental handpiece markets. While remaining cool to the touch, the high-efficiency, slotless design features smooth speed control with wide, continuous-duty speed range up to 40,000 rpm. The 2057 features low vibration to reduce user fatigue, and low audible noise, ideal for long periods of use in sensitive medical and dental patient environments. The temperature on Venus can get hot enough to melt lead. NASA, in a quest to build a rover to explore the Venusian surface, has awarded two grants totaling nearly $245,000 to Ozark Integrated Circuits, a technology firm affiliated with the University of Arkansas, to design heat-resistant circuits for a proposed Venus Landsailing Rover. They'll use a silicon carbide semiconductor as the base of their design. 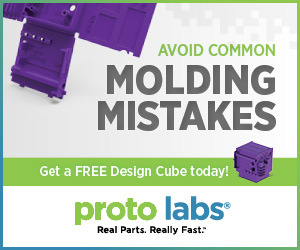 The Proto Labs Design Cube demonstrates injection-molding part features that are too thin or thick, bad bosses, right and wrong ribs, and more. Get yours today! Feedback is used in closed-loop systems in applications all over the world to control speed and/or position, and it has an important role in keeping equipment operating smoothly and accurately. Feedback is available in a variety of devices as well as models. It is important to understand how feedback operates, so the best benefits can be used in the application. This article reviews: open-loop vs. closed-loop applications, tachometers, Hall sensors, incremental encoders, absolute encoders, and resolvers. Operated by the non-profit San Francisco Maritime National Park Association, the Pampanito has been restored by association volunteers to a specific point in time -- late 1945, to represent the height of WWII submarine development. This restoration effort includes making key submarine systems fully functional, so visitors can see the periscope being raised and lowered, and the torpedo doors being opened and closed. DuPont Vamac VMX5000 is a new and commercially available family of ethylene acrylic elastomer (AEM) pre-compounds that extend the upper temperature limit for AEM applications by 15 to 20 deg C and provide a long-term improvement in static heat aging. These new Vamac AEM pre-compounds are currently under evaluation by major auto OEMs and Tier 1 suppliers for seals and gaskets, air management system applications, and high-temp coolant hose covers. They are expected to offer a viable alternative to fluoroelastomers (FKM) at significantly lower cost and lower specific weight, in a temperature range between 160 to 190 deg C -- especially where standard acrylic, ethylene vinyl acetate or AEM elastomers are no longer considered. Click here to learn more about Vamac AEM materials. A little innovation can go a long way toward helping U.S. military forces successfully facilitate their missions. Even an apparatus no bigger than a breadbox recently solved a challenge involving two radios and the need to make their transport lighter. Created to help design engineers understand how membrane potentiometer sensors work and how to pick the right type of membrane potentiometer for their project, this new Hoffmann+Krippner white paper covers the various types of potentiometers, potentiometer development history, their various components and materials, and an overview looking at the technical issues of printed potentiometers and foil (membrane). The paper also covers the various tech specifications of accuracy and linearity when specifying potentiometers. No registration required. Click here to go to the white paper page. FIPA has released a new series of round quick-change systems that provide an extremely reliable connection between assembly and material handling robots and gripper systems. 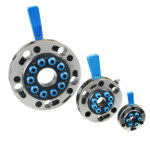 Designed to withstand strong vibrations and rapid acceleration, the new SR Series quick-changers feature innovative, snap-on SAFE-LOCK mechanisms, color-coded locking indications (red for locked, green for open), and pneumatic air connections incapable of being misaligned, ensuring maximum functional reliability and further improving process safety. 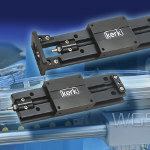 Haydon Kerk Motion Solutions has added the WGS Wide Guide Screw to its linear slide product line. Made from the same quality components used in the RGS Linear Rail Series, the WGS Linear Slide utilizes a screw-driven carriage that offers reliable, continuous linear speed while maintaining accurate positioning. Length and speed of the WGS are not limited by critical screw speed, allowing high RPM, linear speed, and long stroke lengths. This unit has a unique, compact profile that provides improved torsional stiffness and stability. An integral mounting base can provide support over the entire length, which can extend up to 8 ft (2.4 m). Noise, excessive vibration, and relative inefficiency are drawbacks of the piston-based internal combustion engines (ICEs) that power today's lawn and garden equipment, such as leaf blowers and lawn trimmers. But now MIT startup LiquidPiston has developed a 4-lb rotary concept that it says is significantly smaller, lighter, and quieter, as well as 20 percent more fuel efficient than the ICEs used in many such small-engine devices. The 255 million cars on the road in the United States account for 40 percent of the country's fuel consumption. Most of that fuel is wasted. Lei Zuo, an associate professor of mechanical engineering in Virginia Tech's College of Engineering, may have a partial solution: harvesting energy from the car's suspension. The discovery of a previously unknown type of metal deformation -- sinuous flow -- and an easy method to suppress it could lead to more efficient machining and other manufacturing advances by reducing the force and energy required to process metals. 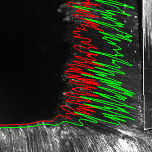 Findings from researchers at Purdue University showed that cutting force can be reduced 50 percent just by using standard marking ink. Jean-Baptiste Mouret, an assistant professor of artificial intelligence and robotics at Pierr & Marie Curie University in Paris, France, has developed an algorithm that allows robots to “learn,” through trial and error, ways to compensate for challenges like broken arms or legs. This video demonstrates how the Intelligent Trial-and-Error Algorithm works to help two robots adapt to challenging situations in under 2 minutes -- with surprisingly lifelike results.